One of the things I like about music and art, is that one can fuse the older with the more modern. In doing this, new ideas and facets of both emerge. In this post, I want to juxtapose this painting by Gericault with k.d. lang’s Season of Hollow Soul. For die hard followers of this blog, you will remember that I have already written once about this song. You can see it here. This song has particular personal importance for me. I remember exactly where I was when I first heard it, and it was the first time I began to realize what was meant by the term “the human condition”. (1) I embedded this video because this painting is so huge in real life, that an image just is not enough. So for those who may not be familiar with this painting, this is really the only way to see it. You can mute the commentary, and just look as the camera pans around. Or, of course, you can listen to the analysis. (2) I do not know k.d. lang in real life. My guess is that should she read or hear about this post, she would cringe at such a comparison. I want to stipulate that what I am focusing on is EMOTION. This is not a comparison of genius. Nor am I suggesting in any way that this is the only piece of art work that could be aligned with Season of Hollow Soul. In fact, I would LOVE comments with pics of other art readers think about when they hear this song. My point in this blog is to show how k.d.’s song is complemented by Gericault’s painting. Both explore the emotions of the human condition. 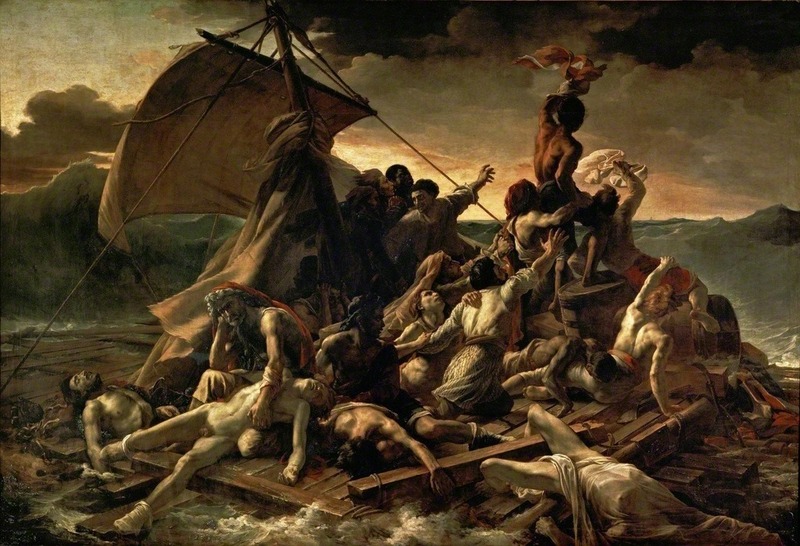 While it is very hard to see, there is a teeny ship far off to the upper right of this painting that the living on the raft are trying to flag down. This is the ship Argus. It represents how intense hope can be in the human condition. For k.d., this same hope is expressed in the chorus of Season of Hollow Soul. The hope is that Fate exists, that it is omniscient in some way, and that it moves towards our best interests. When I look at that mote of a ship in Gericault’s painting, I think about how k.d. understood that Fate is also seemingly so distant and unclear. It is my contention that in this song, she is trying to “flag down” her own Argus while part of her is unsure what the Truth may actually be. Secondly, this painting reminds me of k.d.’s song because of the colors (or lack of them) used. This painting is dark, as is the song. Yet, neither are exactly wholly dark. Just as the painting has areas of light, so too does the chorus of the song emit light beams of the more positive elements of the range of human emotion. And just as the painting has dark areas, so too are the verses of k.d.’s song dark with the soul severing realization of Truth. For example “Sour the fruit of neglect. The core of my doubt. Deprived are my veins you infect. With or without”. In this verse, k.d. alludes to what happens when one’s soul is neglected by living an inauthentic life. And in turn, being inauthentic is the source of one’s discontentment. Whether the inauthentic living is accompanied with or without various levels of Truth is no matter. Discontentment prevails. This overall discontentment is seen in on the raft. Of course, there is the sadness of death to the left, and the nerve wracking balance of hope and fear of not being rescued upward and to the right. Finally, I want to point out that the three main versus (in italics below) are the verbal equivalent to the range of human emotion from despair to hope as seen in the painting from left to right. From the emotional evisceration of loss to the ecstatic murmurs of hope, k.d.’s three main verses explore the range of human experience. Here is what I mean in more detail: In the first verse k.d. explores the vast emptiness of despair; of loss. In the second verse, k.d. points to those times in life when there is time to ruminate on our relationship to Life itself. And in the third verse k.d speaks of the role of fate, of luck, that force us to confront the inherent beauty of Life that we experience in the presence of hope and fear. We question more under the conditions of these two powerful emotions. And questioning is the epitome of human living. So, that is how I see the relationship between k.d.’s Season of Hollow Soul and Gericault’s “Raft of the Medusa“. Your powers of analysis once again astound me. This is a powerful blog and knocks my mind rather sideways. Again. It fits where I currently am almost too perfectly. Your vision sends my mind into places I probably would never go otherwise. It’s not at all comfortable and for that I thank you. It’s just a blog…lol. I think it is important to discuss kd as an artist and not just share pics of her from 30 years ago!! I see this so much and it makes me sad that she is not taken seriously as an artist. Dykon she may also be, but that is far less interesting to me than the quality of original creative expression she provides.